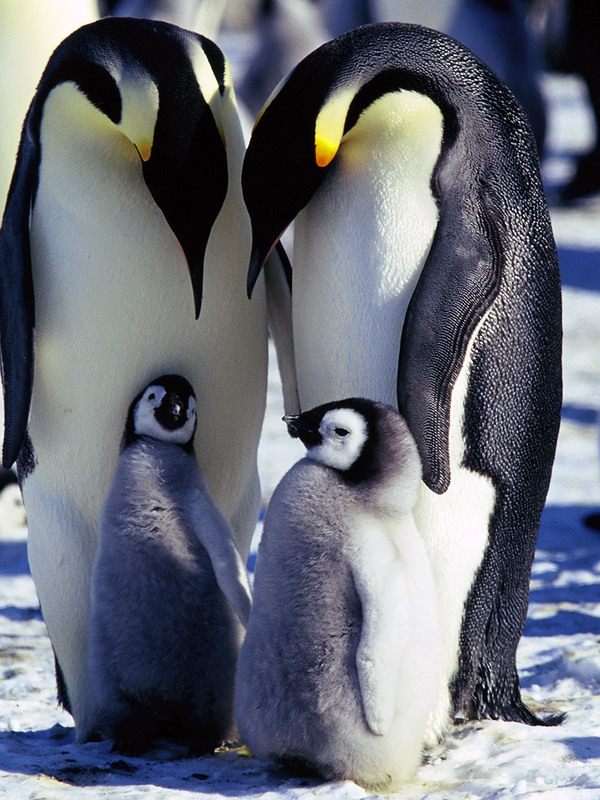 How are Emperor penguins adapted to survive in Antarctica? The largest of all penguins by a considerable margin. Animals of the very deep south and the only large animal that remains in Antarctica in the depths of the long dark winter night. Large size to retain heat - Emperors are twice the size of the next biggest penguin, the king, they are able to survive the extreme cold temperatures of winter without even feeding for extended periods. A large size, with low surface to area ratio slows down the loss of heat, a simple shape and flippers that can be held close to the body also reduce surface area on land. Short stiff tail - on land the tail forms a tripod when the penguin rocks back slightly on its heels, this gives the least contact area with the ice or snow to prevent heat loss. Chicks have soft down for insulation, this is a more effective insulator on land than the feathers that the adult birds have, but are of little use in the sea, they must moult and grow feathers before they can swim. Highly specialized bird skeleton a very upright gait, short neck, short legs and long body. Powerful claws on the feet help to gain a grip on snow, ice or rock when emerging from the ocean or when tobogganing. Huddle together to conserve heat, without this they wouldn't be able to survive the Antarctic winter. The penguins shield each other from the wind by taking it in turns to be on the outside or inside of the huddle, they stand very close to each other but don't actually touch in order to get the maximum insulation from their own feathers and those of the penguins around them. 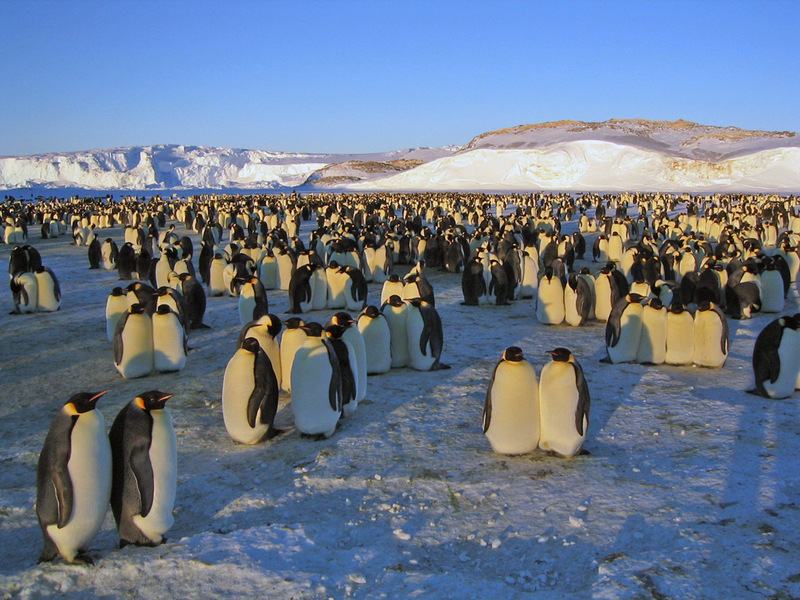 Unlike other penguin species, they are not aggressively territorial, this allows for huddling to take place. 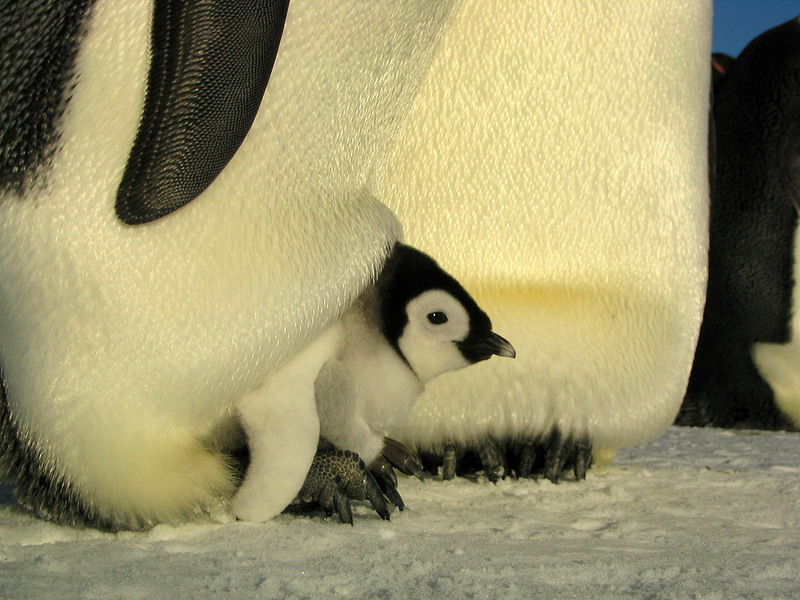 No nest is made, the eggs and then chicks sit on the parents feet to keep them off the ice, they are covered by a fold of skin to keep them warm and are carefully moved from one parent to the other when they are small to allow the parents to take turns to go fishing. Breed during the depths of the Antarctic winter, so the chicks are large enough to become independent during the summer abundance of food, other smaller penguin species are able to grow quickly enough when breeding in the spring. Males will sleep for 20-24 hours a day while incubating the egg and waiting for the female to return, this conserves energy. A complex heat exchange system that allows 80% of heat in the breath to be recaptured in the nasal passages. Heat exchange systems in the flippers and legs keep these regions cooler than the body core and prevent heat loss from places where otherwise would lose disproportionate levels of heat. They can dive to a depth of 1,800 feet (550 meters) and hold their breath for up to 22 minutes, so are able to reach and exploit food resources that other birds can't reach. The normal resting heart-beat is about 60-70 beats per minute (bpm), this goes up to 180-200 bpm before a dive as they load up with oxygen, as they hit the water, the rate drops to 100 bpm immediately, slowing to 20 bpm for most of the dive. Males can make "milk" in the oesophagus which can be used to feed chicks in the winter before the female arrives back from fishing. Males can fast for over 100 days while incubating the egg and awaiting the return of the females.